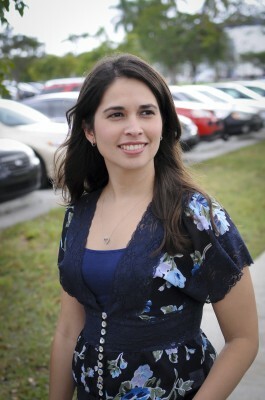 FIU physics Ph.D. student Idaykis Rodriguez ’08 is packing her bags and passport and headed to Lindau, Germany, this summer now that she has been invited to attend the 62nd Lindau Nobel Laureate Meeting. The Cuban-born Panther is the only FIU student granted the opportunity to meet with more than 25 Nobel Prize winners this July. Rodriguez and other invited researchers from around the world will attend presentations and panel discussions. They also will interact with the Nobel Laureates through small group discussions and social programming. As a sophomore in 2004, Rodriguez turned to physics Professor Laird Kramer for guidance and mentoring. Kramer introduced her to Modeling Instruction and the Physics Research Education Group, a research group focused on developing and implementing research-based reform for physics and physics education programs. In 2008, her work from the previous year with the Department of Energy’s Science Undergraduate Laboratory Internships was selected for a poster presentation at the American Association for the Advancement of Science’s (AAAS) annual meeting. Traditional research on physics expertise focuses on the cognitive abilities of physicists to solve problems. In other words, a physics expert is defined by differences in knowledge and skill sets. Rodriguez’s doctoral dissertation, however, examines how expertise is developed in social contexts. Rodriguez is set to defend her dissertation in 2013. Upon graduating, she hopes to further STEM education and help minority students meet their academic goals. After the week-long conference in Germany, Rodriguez will meet up with her husband, Vicente (a 2006 College of Business Administration alumnus), in Paris for a two-week vacation in France and Italy. The couple met as undergraduates and wed in April 2011.